What a week it was. Ryan Zimmerman, one of the hottest players in the league, managed to pick up even more steam and now leads the league in home runs and RBI. Adam Eaton was lost for the season due to a torn ACL, but the Nationals’ offense continued to chug right along. The purpose of the stock report is to help owners find players whose value is rising or falling. My job is to look at a player’s performance, underlying metrics and team factors to determine their value. You can also see this reflected in our rest of season rankings, which are updated regularly. Of course, placing a player with a long-term injury in the “Stock Down” section seems like cheating. So I’m just going to rant about it here. How in the world did Terry Collins, Sandy Alderson and the New York training staff allow Noah Syndergaard to start on Sunday? 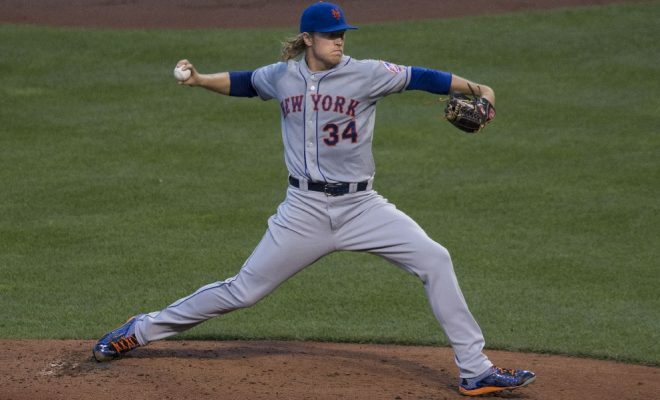 After leaving his previous start with an injury, Thor was unable to raise his arms above his head two days before his start. Instead of doing the smart thing and skipping a start or two, the Mets let Syndergaard go rogue. He refused an MRI, pitched through his injury and now is on the DL with a partially torn lat. Don’t get me wrong Thor should be blamed just as much as the Mets staff. However, after throwing Steven Matz under the bus, and now this, every single member of that training staff needs to be fired. Yesterday. Syndergaard is still one of the best arms in the majors, but the lengthy absence has dropped his stock dramatically in re-draft leagues. Thor owners in keeper and dynasty leagues should be worried as well. Hopefully, the Mets have learned their lesson and will wait until Thor is FULLY healthy before letting him pitch again. After all the hype he received for coming from Cuba last season, Gurriel started the season quite poorly. 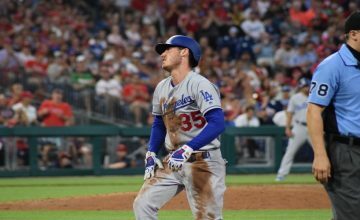 After his first eight games, the 32-year-old was batting .125 and had been dropped to ninth in the batting order. With only modest power, there wasn’t much reason to hold onto him while he struggled. Over the last two weeks, Gurriel has caught fire. Batting .409 with two home runs, six RBI and eight runs scored. The performance has caused manager A.J. Hinch to move Gurriel up to sixth in the batting order. His BABIP over the last two weeks sits at .371, so expect his .329 average to fall a bit. However, Gurriel still possesses the contact skills and has enough power to be a productive member of the Astros’ lineup. His 92.1% Z-contact rate combined with a 37% hard-hit rate, means that Gurriel is consistently making good contact with pitches in the zone. If he continues to hit well, he could be moved even higher in the lineup, providing a boom for his lagging counting stats. Another thing to be concerned about is his awful walk rate, which stands at 1.2%. He’s not a perfect hitter, but the stats show that he can be a decent corner infield option in 12 team leagues. For years, Archie Bradley was heralded as one of the baseball’s top pitching prospects. Unfortunately, he was never able to live up to his potential as a starter. Over 34 major league starts, Bradley held an ERA over 5.00 and a BB/9 over 4.5. No longer part of the rotation, Bradley is enjoying a career year as a versatile weapon out of the bullpen. Archie has appeared in eight games as a reliever and holds a 1.13 ERA to go along with a 0.75 WHIP. The walk problems that have plagued him throughout his career seem to be under control, as he’s walking just 1.69 batters per nine innings. Torey Lovullo has said that Bradley is not a candidate to take Shelby Miller’s spot in the rotation, which means he can remain a relief dynamo for the D’Backs. He already carries value for owners in holds leagues, but he could soon be an option for owners who need saves. To the surprise of no one, Fernando Rodney has been awful as the D’Backs closer. He’s nailed down seven saves but carries an 11.45 ERA after giving up eight runs over his last 2.2 innings pitched. Lovullo maintains that Rodney is still the closer, but his leash has become significantly shorter. If Rodney does lose the job, Bradley will be at the top of the list of replacements. Here I am, one again trying to convince the masses that DeShields is worth owning. I tried to sell owners on the speedy DeShields before the start of last season, and I fell on my face. This time will be different! For now at least. As of May 3rd, DeShields has been named the Rangers starting left fielder. He’s started and batted leadoff in six straight games. In those six games, he’s batted .333 with eight runs, one home run and three steals. The job will belong to DeShields at least until Adrian Beltre is activated from the DL. After that DeShields will need to compete With Joey Gallo for the job. He’s improved his play significantly this season, walking in a career-high 14.3% of his AB’s. His BABIP sits at .391 so his average might fall a bit, but owners in need of cheap speed off the wire should take a look at DeShields while he has a starting job locked down. Not the start to the season that Cotton or the A’s had been hoping for. After a sparkling cup of coffee to end 2016 (2.15 ERA in 29.1 innings) Cotton has struggled mightily to start 2017. Through five starts, Cotton holds a 5.00 ERA and is walking 4.00 batters per nine innings. For Cotton, a 4.00 BB/9 is obscene, as he holds a career mark of 2.56. Cotton’s problems might stem from his struggling changeup. 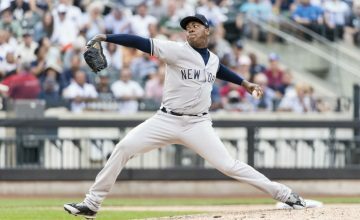 In 2016, he threw his best pitch 28% of the time for a 3.06 pitch value. This season, Cotton is only throwing the changeup 21.6% of the time for a -0.83 pitch value. With such a dramatic dip in the effectiveness of his best pitch, it’s no surprise that Cotton has been struggling. After his poor outing against the Astros, Bob Melvin has said that Cotton will make his scheduled start against the Twins on Thursday. It might be his last chance to secure a spot in the Oakland rotation. With Sonny Gray and Sean Manaea both getting back to full health, Cotton is in danger of being sent back to Triple-A until he can work out the kinks. After a couple years of solid production, Vogt has gotten off to a terrible start this season. Through 18 games, the catcher is batting .210 with one home run and three RBI. Vogt hasn’t hit a home run since opening day and hasn’t driven in a run since April 21st. Vogt is striking out at a higher rate (18.5%) and walking at a lower rate (3.1%) than he did last season. His BABIP sits at .240 so there is some hope for regression, but any improvement won’t be drastic. Vogt normally sits against lefties (career .210 AVG) but may sit more often if Josh Phegley can provide any kind of offensive boost. His ownership numbers have already taken a nosedive, but owners holding him shouldn’t feel bad looking for other options. On the surface, Hamels’ performance has been pretty good. The veteran is 2-0 with a 3.03 ERA and 1.13 WHIP. Under the surface, Hamels’ performance raises a number of red flags. What jumps off the page first are his strikeout numbers. The workhorse carries a career K/9 of 8.56 but is striking out just 4.13 batters per nine this season. His walk rate has also stayed close to the poor rate it was last season. As a result, his K/BB stands at a career worst 1.25. Going deeper into the stats we see a terrifying decline in Hamels’ advanced metrics. As outlined by Paul Swydan of FanGraphs the two most concerning declines are Hamels’ O-Swing% and his overall Contact%. Hamels’ O-Swing% has decreased by 10% this season, meaning that hitters are laying off pitches that he places outside the zone. 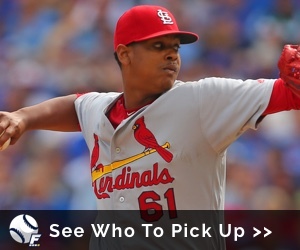 His 25.1% ranks near the bottom of the league among pitchers that have more than 20 innings this season. His Contact% has jumped 8.1% to a career high 82.8%. Batters are also making a lot of hard contact against Hamels, whose hard hit% sits at a career worst 36%. To put a cherry on the awful sundae, his BABIP sits at .219 and is due for some regression. Beyond all the stats, Hamels was scratched from Tuesday’s start with an oblique injury. This might be the reason for his struggles but we won’t know until he returns. News regarding the severity of the injury hasn’t been released, but oblique injuries tend to be trouble for pitchers. ← Previous Story 2017 Fantasy Baseball Week 5 Rookie Report: What Did We Learn? Winning fantasy leagues since 2004. Losing them for much longer. Follow Jonathan on twitter @jchan_811 and he'll be ready for all your questions! Copyright © 2019 Fantasy Six Pack.